New Delhi: While rich-class is trying to enter politics through the power of their money, there is a person who left behind all such affluence for social work and now through his efforts, various political surveys are expecting that Bharatiya Janata Party may announces him as their candidate from Osmanabad Lok Sabha seat in upcoming 2019 elections. 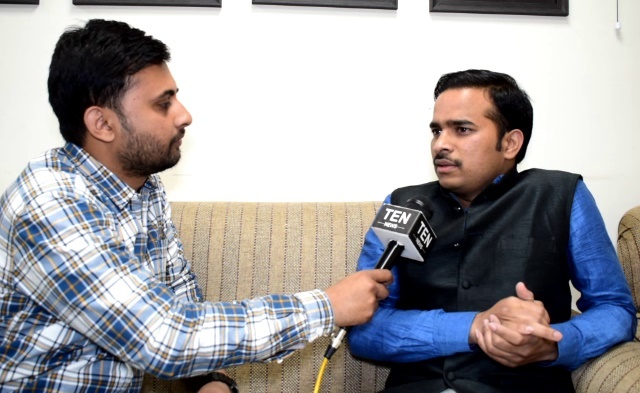 When Ten News reached to Yogesh Kedar in New Delhi, the down to earth man narrated his journey of his life from sleeping on roads of the national capital to working as a subordinate to Rajya Sabha MP Chatrapati Sambhaji. Kedar was born in poverty-stricken family and spent initial years of his life in a house which even don’t have proper gates. During his college days, he remembers that he had never visited college for more than two days in week as he has to work to earn a living, to overcome then circumstances he went to delhi to prepare for UPSC exam with just thousand bucks in his pocket, during these days he spent nights sleeping on roads as it was hard for him arrange a place to live. Few days later went back to his home as he was not able to meet the expenses to live in the national capital. Now this common man is serving as the personal secretary to one of Maharashtra’s prominent personalities Chatrapati Sambhaji, Rajya Sabha MP. While politicians were enjoying their corrupt cheese and whine, Kedar has accomplished several high level tasks for the development of Osmanabad including rail connectivity, amrit yojna, opening of a passport office and a railway reservation counter. Now various mainstream surveys are expecting that the saffron party may announce him as the Lok Sabha Candidate from Osmanabad while reacting to this Kedar believes that it is impossible for a poor person to contest election as politics is pitch of rich class. Kedar is a determined, confident and thinks about the development of Osmanabad.